Thanks to MilanoCard, the Milan city pass, you can travel for free on Milan public transport. Click here for more information. If you come in our city you need to know how to travel in the city with transport of Milan. Below you will find a comprehensive Milan transport guide and links from the airports. ATM guarantees the service every day, except in exceptional situations outside the control of the company. Each schedule has developed into weekdays, Saturdays and holidays. – Rush hour: 7.00 am to 9.00 am and 5.00 pm to 8.00 pm for the subway lines, and the surface lines. On December 25th and on May 1st the service is provided from 7.00 am to 7.30 pm. In the other festivity the service is is guaranteed with normal holiday schedule. The summer schedule will be in place from 9th July to 4th September 2016. From 1st to 28th August 2016 the lines carry out the Saturday schedule in the days from Monday to Saturday and festivity schedule on Sundays and festivity. In case of strike the service takes place in the time of guarantee bands, from the starting of service until 8.45 am and from 3.00 pm to 6.00 pm. The red subway starts from Sesto 1° Maggio to Rho Fiera and Bisceglie. Every day the first subway starts at 6.15 am from Sesto 1° Maggio, at 6.16 am from Rho Fiera and at 6.20 from Bisceglie. From Monday to Friday the subway passes every 4-8 minutes, on Saturday every 7-8 minutes and on Sunday and festivity every 11-12 minutes. The last subway is at 0.10 from the terminus. The stops don’t included in the Milan urban area are: Sesto Rondò. Sesto 1° Maggio, Pero, Rho Fieramilano. The green subway starts from Abbiategrasso and Assago Milanofiori Forum to Cologno Nord and Cascina Gobba. Every day the first subway starts at 6.00 am from Assago Milanofiori Forum and Abbiategrasso, at 6.05 am from Cologno Nord and at 5.55 am from Gessate. From Monday to Friday the subway passes every 8-12 minnutes, on Saturday every 10-20 minutes and on Sunday and festivity every 20 minutes. The last subway is at 0.36 am. The stops after Cascina Gobba, to Cologno Nord and Gessate, aren’t included in the urban area of Milan. The stops don’t included in the Milan urban area are: Assago Milanofiori Forum and Assago Milanofiori Nord . The yellow subway starts from Maciachini to San Donato. Every day the first subway starts at 6.00 am from Maciachini and at 6.00 am from San Donato. From Monday to Friday the subway passes every 2-4 minutes, on Saturday every 5-6 minutes and on Sunday and festivity every 6-7 minutes. The last subaway is at 0.20 am. The lilac subway starts from San Siro Stadio to Bignami. Every day the subway starts at 6.00 am from Bignami, at 6.00 am from San Siro Stadio. From Monday to Friday the subway passes every 3-4 minutes, on Saturday every 4 minutes and on Sunday and festivity every 4 minutes. The last subway is at 0.00 am. Thanks to MilanoCard you can get all public transport of Milan for free. Click here for more information. The schedule of the beginning and of the conclusion of the service change depending on the type of the lines. In the evening time slots, from 9.00 pm, the service has a medium frequency of 15 minutes on the main lines, a medium frequency of 20 minutes on the other lines. 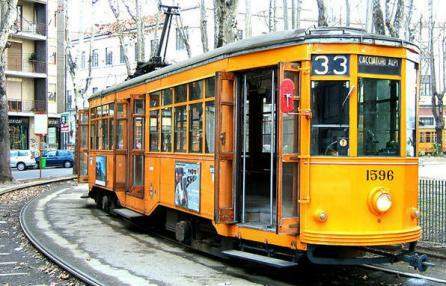 Get free public transport of Milan for free thanks to MilanoCard. The Malpensa Express is an airport rail service linking the city of Milan with Malpensa Airport, in Lombardy. Trenord, a railway company established by Trenitalia and Ferrovie Nord Milano, operates Malpensa Express services between the Malpensa Airport and both Milan Cadorna Station and Milan Central Station. The train ticket for Malpensa Express also includes the shuttle bus connecting Terminal 1 and Terminal 2, which doesn’t have a pedestran connection to Terminal 1 or train station. Thanks the bundle MilanoCard + Malpensa Express you can get 20% on total. Click here for more information. The passing railway of Milan is a infrastructure almost entirely underground that crossing Milan. The suburban lines make possible a whole new way to move by train. The lines S connect the hinterland area of Milan and the city center, through the underground railway and along railway lines surface. The passing railway passes every 5-6 minutes. To access the rail link will we cross the turnstiles. The passing railway statitons are all equipped with light panels that provide information about the time of arrival and destination. The passing railway is crossed by the suburban lines S1 (Saronno – Lodi), S2 (Camnago – Milano Rogoredo), S5 (Treviglio – Varese), S6 (Novara – Pioltello/Treviglio) and S13 (Milano Bovisa – Pavia). Thanks to MilanoCard you can get all piblic transport of Milan for free. Click here for information. It is located in the district of Varese, it is the major airport of the city. It is 45 km from the city center, conneted at the center of Milan by a service of buses of Autostradale. The buses start from 4.30 am to 11.00 pm from Milan and from 6.00 am to 00.30 am from Malpensa. The buses start every 20 minutes. It is located in the district of Peschiera Borromeo. It is 7 km from the center of the city, conneted to the city with the buses of Autostradale. The buses start from 5.30 am to 10.00 pm, every 30 minutes. It is located near Bergamo, it is the aiport dedicated to flights of low cost airlines. It is 50 km from Milan, conneted to the city with the buses of Autostradale. The buses start from 2.45 am to 11.15 pm from Milan, from 7.45 am to 00.15 am from Orio, every 30 minutes. Thanks to MilanoCard you can get 10% on return airport bus ticket from Malpensa Airport and from Bergamo Airport. With MilanoCard you can get free Linate bus express X73 that arrives at Piazza San Babila (near piazza Duomo). Click here for more information. Milan Museum pass – Discover the City of Milan! Have a great experience in Milan !